He is based on Hubot tech and will post the code to gitlab. Maybe we can get some collaboration on expanding bottie's services etc. Bottie's code linked below. Pull Requests (merge requests as gitlab calls them) welcome. Bottie the second. Hubot bot . He listens in all open channels (channels with a #) and listens for commands. Bottie is everywhere. We can update IRC bottie to be the same bot as well eventually as Hubot can plug in to many platforms. bottie animate me <query> - The same thing as `image me`, except adds a few parameters to try to return an animated GIF instead. bottie calculate <expression> - Calculate the given math expression. bottie convert <expression> in <units> - Convert expression to given units. bottie help - Displays all of the help commands that Hubot knows about. bottie help <query> - Displays all help commands that match <query>. bottie image me <query> - The Original. Queries Google Images for <query> and returns a random top result. bottie map me <query> - Returns a map view of the area returned by `query`. bottie mustache me <url|query> - Adds a mustache to the specified URL or query result. bottie nslookup <hostname or ip> - Performs nslookup on host or ip. bottie ping <hostname or ip> - Performs 10 packet ping to host or ip. bottie the rules - Make sure hubot still knows the rules. bottie traceroute <hostname or ip> - Peforms a traceroute (using mtr) to host or ip. bottie youtube me <query> - Searches YouTube for the query and returns the video embed link. 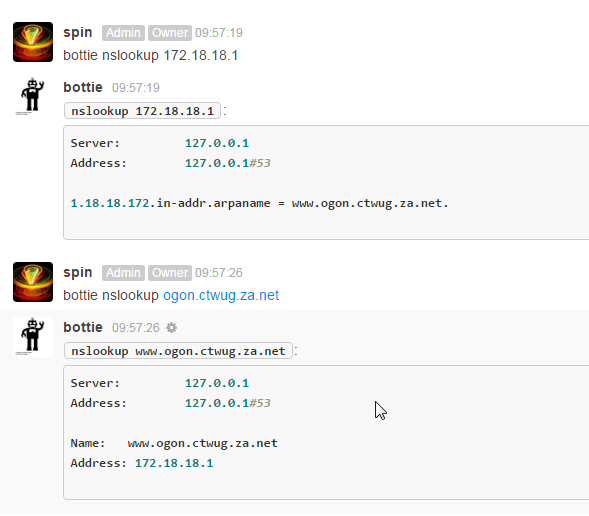 These instructions are run from the host on which botties sits (obliquity.ctwug.za.net). This is a machine in the UK, and links to the CTWUG via tunnels. 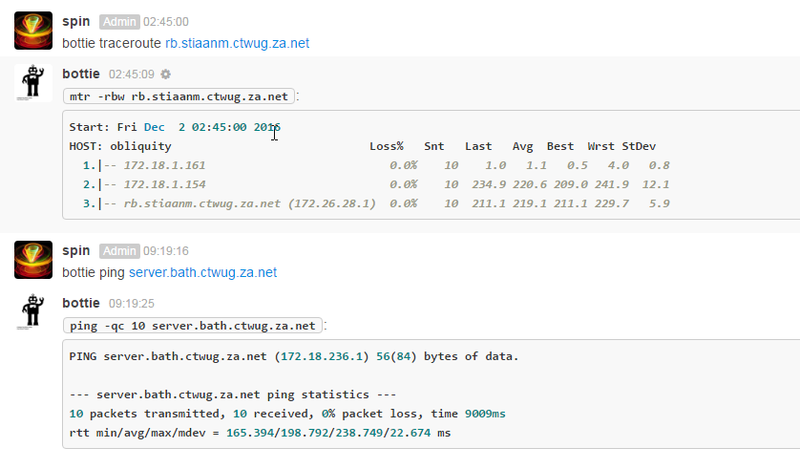 This should explain the "large" round trip times in ping and traceroute below. bottie shows the command it sent to linux and sends you back the output from the command line. results.-c 10 means run 10 pings. The summary shows packet loss, total time, and round trip time (minimum, average, maximum and standard deviation). This doesn't run the traceroute command but uses mtr command which is far more easier to work with and produces better output. It shows you the traceroute (with IPs and reverse lookups), packet loss and number of packets sent. It shows you statistics for round trip time (RTT) to each host including the last RTT, the average, the best and the worst. As well as the standard deviation (how variable the RTT is, bigger is bad). This looks up an IP or a reverse lookup for host. Note that the formatting code in chat will sometimes remove some of the text that you enter (e.g. the leading www in the second example below). The server text is just showing you that bottie is using the dns server that is running on obliquity. I've updated IRC bottie (Bottie 1.0) to not post every forum post anymore. It will only do new threads from now on.